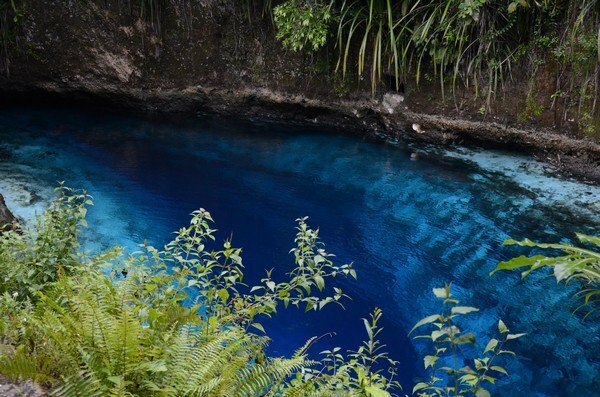 The Hinatuan Enchanted River, 8.458886°N, 126.354667°E is in Barangay Talisay, Hinatuan Municipality, Surigao del Sur, Caraga Region (Region XIII). It is accessible from both Butuan City (2.5 hour vehicle ride) and Surigao City (4 hour vehicle ride). This particular river starts from the underwater cave entrance at 30 meters depth, forms into a spring pool, and flows out to sea. Its stream is approximately 1,000 meters long starting from the spring pool and terminating at its outlet to sea. The area is now Mindanao’s main tourism destination. On weekends, crowd of more than 1,000 persons is not unusual, most if not all partake in the swimming activities. HERUCS is a contiguous ecosystem joining the underwater cave and the terrestrial area that are unique and a home to a wealth of unexplored biodiversity. Concerned stakeholders now fear that the gaining popularity of the site will result in the degradation of the critically fragile ecosystem and will result to the loss of the still undocumented biodiversity treasure. The Local Government Unit of Hinatuan was able to acquire ownership of the lands around HERUCS totaling to 27 hectares. A ordinance declaring the HERUCS as eco-tourism area had also been adopted. Moreso, the DENR and DOT had recently facilitated the determination of the area’s carrying capacity. This project will greatly augment the present efforts of the LGU of Hinatuan to sustainably utilize and develop HERUCS. The LGU of Hinatuan had expressed desire to declare HERUCS as conservation area expanding the coverage to 150 hectares and having more conservation supportive legal provisions. On March 20-24, 2015 the FCD with the University of San Carlos- Biology Department, DENR-BMB and GIZ will conduct the first ever Rapid Source Assessment of the Enchanted River. There will be daily sampling of the water from the outer, middle and inner parts of the cave system. Biological assessments and sampling of specimens both flora and fauna will also be made by the accompanying university biologists. Mapping will be conducted by the cave diving team to enhance previous data gathered during earlier surveys by FCD founders, Dr. Alfonso Amores, Jake Miranda and Bernil Gastardo. Joining the survey team is FCD Alex Santos. He is the 1st cave diver to explore the cave system back in 1999. Visit http://www.facebook.com/FilipinoCaveDivers for real-time updates of the upcoming survey.